1. Big temperature & humidity display with cute outlook. 2. Temperature range: 14 ~122 （-10°C~50°C）. 4. With Max & Min records. 5. Wall hanging or table standing. 7. Powered by 1Xaaa battery (not included). Precautions: Please remove the batteries if storing this product for a long period of time and do not use it near the water and other solvent chemicals. Warranty: BALDR provides a 1-year limited warranty on this product against manufacturing defects in materials and workmanship. 【TEMPERATURE DISPLAY】 : Temperature display in F/C selectable, Temperature range: 0~+50C. 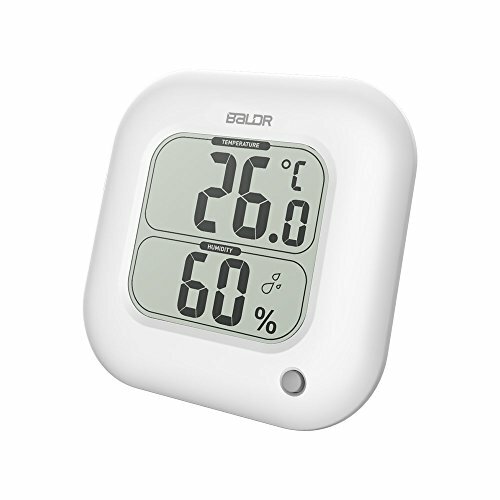 【HUMIDITY DISPLAY】: Gauge indoor Humidity , Relative humidity range: 20%~95%. 【MAX/MIN RECORDS】: Max and min temperature/humidity display.